The new René Herse cranks will be offered in one length only, 171 mm, which allows us to have the cranks forged to their final shape. (The photo above shows the raw forging.) The process is called “net-shape forging.” The grain structure of the aluminum is aligned during the forging process, so that it follows the contours of the crank. Net-shape forging optimizes the crank’s strength and enables us to offer a lightweight part without undue concerns about reliability. When small-production cranks are offered in different lengths, they usually are made with an adaptable forging, like the raw forging for the TA “Pro 5 vis” cranks shown below. On the right side, you see how the pedal eye area is elongated. The crank is machined to the correct length by cutting away material near the pedal eye. The following illustrates what happens when you do extensive machining on a forging. 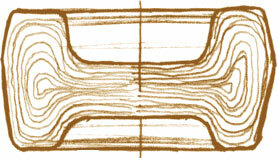 Above is a schematic drawing of a raw forging. You can see how the grain structure conforms to the final shape. This makes for a very strong part. When we cut off one end, we interrupt the grain structure at that end. Each of these interruptions is a weak spot. On a crank, the interruptions occur at the pedal eye – one of the places that are subject to the most stress. If a crank breaks, it often happens at the pedal eye. Machining the crank to length has eliminated the advantages of the forging process in this area. “Net-shape” forging keeps the grain of the crank intact. The result is a stronger crank. 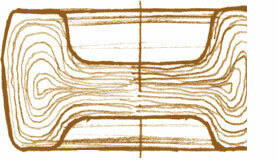 If you want to offer multiple lengths, a better way is to make separate forging dies for each length. However, this multiplies the cost, especially with small production runs, whereas machining the cranks to length costs very little, because the cranks already are going to be machined for the pedal eye, chainring interfaces and spindle taper anyhow. But what about riders who need a different crank length? I used to think that I was highly sensitive to crank length. I found the 175 mm-long Shimano Deore triple cranks on my touring bike much harder to spin than the 172.5 mm Campagnolo cranks on my racing bike. It was obvious to me that the 2.5 mm extra length made the touring bike’s cranks difficult to spin. Then I visited my friends Pamela and John in Boston. I had brought my Bike Friday along, but since we were to enter a 300 km brevet together, Pamela suggested that I should ride a bike with better performance. They were to ride their tandem, and John’s bike fit me fine, so why not take it instead? Very well, except it was equipped with 175 mm cranks, and I was concerned about being able to spin such long cranks. John scrounged around and tried to find shorter cranks for me, but his bike was optimized for narrow tread (Q factor), and none of the shorter cranks would fit. I decided to take a chance and ride John’s bike with the long cranks. To my surprised, I could spin his 175 mm cranks very well. I had a great ride on the hilly roads of Connecticut with my friends, and never felt bogged down like I did on my touring bike. I realized that it had not been the length of the Deore cranks that inhibited my spin, but their width. Their tread (Q factor) was at least 20 mm wider than my Campagnolo cranks. John’s cranks were as long as the Deore cranks, but their tread (Q factor) was almost as narrow as that of my Campagnolo cranks. Let’s look at the length by itself: The difference of 2.5 mm amounts to only 1.4% of the total crank length. The cranks in the photoshopped image show the range that most manufacturers offer, from 165 mm on the left up to 175 mm on the right. The cranks look similar because they are similar: The longest crank is just 6% longer than the shortest one. Imagine putting five random people next to each other: Their leg lengths would not be within 6% like the lengths of the cranks in the image. If we wanted to scale our cranks to our leg length, we would need lengths between 140 and 210 mm, as Lennard Zinn suggests. And according to this formula, I would need 186 mm cranks. Crank length does not matter for most riders, and the small differences in the commonly available crank lengths don’t affect how the cranks feel and perform. Crank length matters, and the crank makers have it all wrong. They should offer lengths that vary by 30% or more. My experience suggests that 1. is correct, that small differences in crank length do not make a big difference. Today, I am as happy spinning the 175 mm cranks on Mark’s bike as I am on an old René Herse with 165 mm cranks. Compared to other factors, such as the tread (Q factor) and the flex characteristics of the frame (my touring bike with the Deore cranks also had a stiffer frame that contributed to the “bogged-down” feeling), crank length appears to matter little for most riders. If you are outside the “normal” size range of cyclists, then you may benefit from significantly longer or shorter cranks. By significant, I mean not just a 165 mm or a 175 mm crank instead of a 170 mm. For example, I went to some lengths to put 150 mm cranks on my children’s bikes, and very tall riders may benefit from significantly longer cranks. We are confident that our 171 mm cranks will work well for the vast majority of cyclists. For those who “need” a 175 mm or a 165 mm crank, we ask them to re-consider whether the 2-3% shorter or longer René Herse cranks really will feel very different. If future research finds that crank length does matter after all, then all makers will have to start making 140 mm and 210 mm cranks. In that case, we will make additional forging dies for those lengths. Until then, we hope that most riders will be happy with our 171 mm cranks, even if they are 4 mm shorter or 6 mm longer than their preferred length. In our opinion, the advantage of a stronger crank is worth the slight compromise in the length. This entry was posted in Cranks, Product News, Testing and Tech. Bookmark the permalink. Why does the extra material on the multi-length forging have to be machined away? The extra material will not affect clearance or weight. Would any user choose cosmetics over strength and fit? The highest-stress area of a crank arm is not at the very tip, so cutting off that bit at the end, while certainly not theoretically optimal, works just fine. The vast majority of broken aluminum cotterless crank arms have separated just above the pedal eye, in my experience. Often, this is due to the shape of the arm itself, with the narrowest cross-section occurring at that point, combined with a (very rare) forging flaw, some external nick/damage, or, in some cases, a stress-riser of a ‘flute’ feature ending at that point, or even decades of severe toe strap rub causing a reduction in cross-section, leading to eventual failure. The old Campagnolo Record cranks that experience the infamous ‘cracks at the spider junction’ almost never fail at that location, by the way. Cranks run in a circle, so 5-10 mm of additional length is 10-20 additional mm of diameter. This is quite significant, especially when spinning at 100 rpm, for example. To make just one length of crank arm, and then try very hard to convince folks that the length doesn’t matter seems somewhat disingenous to me. Lennard Zinn’s arm length recommendations are silly, so to cite them as being somehow relevant thinking is also rather silly, in my opinion. No one uses them (for very long, anyways – see e.g. Grant Peterson’s stupid-long Zinn-recommended slightly-used crank arm pair that he had for sale for years on the Rivendell site – no one has purchased it)! Greg, you are correct that the failures usually occur just inward of the pedal eye. However, unless your crank is the shortest available length, that is exactly where the cutting occurs when you machine the blank. Look at the TA forging blank, and you see how you will cut into the grain structure just inward of the pedal eye to make the pedal eye nice and round. Regarding crank length, the 20 mm on a 350 mm circle is the same proportion as 10 mm on a 175 mm radius, and always comes out to a 2.9% variation from the mean value of 170 mm. I know it is hard to accept that we have been worrying about “meaningless differences of potentially significant variables,” as Jim Papadopoulos once put it. Isn’t that how the cheapo TA ripoffs made by Electra are made? More than a year ago the left crank on my porteur/commuter bike failed while I was visiting another city. I was able to find a used crank at a local shop, but it was 165 instead of 170 like the right side. I thought I would replace it when I returned home, but it bothered me so little it is still on the bike more than a year later. I too thought I was very sensitive to crank length. Now, not so much. I winder if you’d consider writing a post on Q/tread? You mention it quite a bit and I, and others, would likely benefit from your thoughts. That is a good idea. For now, I’d like to say that it’s as personal as saddle selection, but traditionally, many avid cyclists have preferred a narrow tread (Q factor). Thank you for the time and devotion you bring to the understanding of cycling. Your blog is one of half-a-dozen that I visit daily to get a handle on the trajectory of cycling. May you live & ride long and far. I second your sentiments. Care to tell what the other blogs you read are? I’m always looking for good info and different angles. Thanks for another cool blog entry and discussion, and thanks to those others for adding their insights and opinions. Lately crank length and Q-factor have been on my mind a lot. I’m really not sure if I’m sensitive to crank length or not but I think I am. Having spun 165s then 167.5s on a fixed gear for over a decade (much of that time as a messenger in a hilly, often windy, sometimes snowy city) and also having pedaled geared road bikes with 170s for longer, but usually less frequently, I now find it really hard to get used to the 175s I’m using on a fix geared mountain bike for our local cyclocross series – there are so many factors to ponder. I love the wide spectrum of opinions to ponder… it’s fun and enlightening and it further enhances my interest in cycling. All the bikes that I ride any significant distance have 175 cranks. A few days ago, I borrowed a bike that was VERY similar to the bike I ride most. Several miles in, I felt that something was “off” about the pedaling feel. I then discovered that it had 170 cranks. I had been considering the new Herse cranks, but now I’ll probably pass. It’s not like I was having horrible knee pain or anything, but it definitely didn’t feel right. I could probably get used to it, but I have many bikes and can’t really afford to put new cranks on all of them, and don’t want to deal with an “adjustment period” every time I switch. Also I know that I can ride 175 cranks for hundreds of miles at a stretch with no discomfort, so I hesitate to mess with my setup. I hope you eventually make 175 cranks, since some of us do notice the difference! Like you, I used to think I could pin-point crank length as the factor that influenced my different pedal strokes on different bikes. Did you measure the tread (Q factor) of both bikes? What about the tubing selection? (I find that I can spin better on bikes that “plane” for me.) There are many factors that could play a role. That said, you may be one of the few riders for whom a 2% difference in crank length matters. We have been thinking about a double-blind test of crank length. It’s easy to do – just switch the cranks on a given bike and have a rider go out for a ride. We’ll have to experiment how much we’ll need to adjust the saddle height for each change in crank length. Of course, we’ll use a bike that doesn’t have toe overlap with any crank length, otherwise that could give the game away. I now have 180mm cranks on many of my bikes and greatly prefer them. I’ve got a superstiff full carbon bike and a wet-noodle ALAN, both of which originally had 172.5 cranks and fit me much better now with 180s at the same q-factors. They do improve the kinetics of pedaling for me slightly, but what I really like about longer cranks is that they improve my fit on every other part of the bike. They keep me from needing quite as much saddle setback, so I can comfortably use a leather saddle and a reasonable length stem. They also help me position myself over the rear wheel on technical trail descents without needing to drop my saddle beforehand. It’s important enough to me that I will even trade some Q-factor to get longer crankarms. I have 190mm and 185mm cranks on my bikes. Alas, 171s are out of the quesetion for me however much I may like the new RH cranks. V. and Fred: Cranks that long are available from very few makers… Which models do you use? I use Zinn 190s and TA Carmina 185s. Few retailers or online shops appear to stock cranks longer than 175 mm, indicating that those who like cranks that are significantly longer than the 171 mm we will offer are few and far between. For those of you who prefer 180 mm cranks or longer, I am glad that TA, Zinn and maybe a few other makers offer them… but when we had to choose a single size, we had to pick one that was more popular than that. See also Sheldon Brown’s comments on crank length. But why the rather odd Number of 171? 172.5 would gave been right in the middle between 165 and 180 which seem to be the two extremes one can find without resulting to absolutely specialist makers/sellers, and right in the middle of 170-175 range which appears to be the standard choice from most retailers. When we started the project, we wanted to make sure nobody would pass off these cranks as a 1960s or 1970s crank from the Herse shop in France. I suggested taking the most-often used length of 172.5 mm and making it a millimeter shorter. That would make the cranks easy to distinguish. However, specifying crank length to half a millimeter when we believe that small differences don’t matter seemed silly, so we settled on 171 mm. As the new Herse crankarms are slightly ‘bent’, there is apparently no danger of anyone mistaking these for original cranks, and thus marmotte’s comment is still valid, and your answer does not make sense to me. I, too, feel 172,5 would have been a good compromise for most cyclists, – certainly the ones i know, who all tend to use 170 to 175 cranks. I myself use 180s on my road/rando bike, and i believe the long cranks help me climb faster (standing, it must be said) than my fitness would indicate possible. I don’t doubt your need to save costs and only offer one size; the debate is ‘which one size?’ and it seems to be quite a heated one! I too look forward to a blind test of tread width, something i’ve rarely thought about and never measured on any of my bikes. The “bent” shape evolved only after we determined the width. As I said, it seems pointless to argue over 1.5 mm… In any case, the forging dies are made, and there is no way to change the length. Jan, except for the occasional mention of your children, I’m disappointed that you overlook the needs of riders of any height significantly different than your own. That includes the vast majority of women. In fairness, most of the bicycle industry does the same. I am a woman of fairly average height at just under 5’3″. I have ridden bikes with a variety of crank lengths; the best for me is my current bike with (expensive) 155 mm TA cranks. While the difference between crank lengths of 170, 171, 172.5, and 175 mm is indeed pretty insignificant, having 155 or 185 cranks can really make a difference to some riders. It is hard for any woman who is not of above-average height to find a bike that fits. Terry and Rivendell are among the few manufacturers who appear to have given some serious thought to the needs of shorter riders, but they have to choose most components for their bikes from the same makers as everyone else. I understand your concerns, and I share them. Obviously, it is difficult to test bikes that we cannot ride, but we are working on a big feature for the Spring 2012 issue of Bicycle Quarterly on bikes for riders outside our size range. Geometries, tubing selection, etc., together with experiences of riders who have ordered custom bikes. The two riders who will be featured are 5′ 4″ and 6′ 4″. It’s an unfortunate fact that bike design has evolved for riders who measure between 5’8″ and 6′. Tubing selection, wheel sizes, components all are optimized for that size range. However, it doesn’t have to be that way, and once we offer the parts that 90% of cyclists need and can use, we can turn our attention to the needs of the remaining 10%. Regarding the cranks, we don’t have the resources to make multiple forging dies. Making one crank is already a huge investment. Offering multiple lengths from the same forging die would compromise the strength and reliability for 90% of riders. We chose not to do this, even though we’d sell more cranks if we offered multiple lengths. Unfortunately, this means that maybe 10% of riders may not find our cranks useful. Hopefully, we will be able to offer other sizes in the future. And maybe some “undersize” tubing, so you can get the flex characteristics of a “superlight” 58 cm frame in a bike that fits you! Thank you for your thoughtful reply. I would like to respond to one point of yours: you suggest that 90% of cyclists are in your height range of 5’8″ to 6′. Perhaps you meant to say “male cyclists”? The average height for women is just under 5’4″. 90% of women are under 5’8″, so only 10% of women are in your target height range. If there are fewer female than male “serious” cyclists, perhaps its because most women never have the opportunity to ride a bike that fits them properly, so they can’t enjoy cycling enough to become enthusiasts? I suggested that bike design has evolved for a certain size range of cyclists (5’8″ to 6′). In the next paragraph, I meant to say that 90% of cyclists, no matter their height, find that cranks between 165 and 175 mm work well for them. It was remarkably easy to find two used sets of 150 mm TA cranks for my children, because there appears to be so little demand for them… I suspect that there is little demand even for the 165 mm cranks that most companies offer, and thus little incentive to offer shorter lengths. The same applies to cranks longer than 175 mm. Campagnolo and Shimano offer them, yet you won’t find them in many shops or even online, presumably because there is little demand. I am well aware that there is a large audience of underserved cyclists who don’t fit the stereotype of the “avid” cyclists the industry has in mind. In fact, we developed our Compass 26″ tires in part because of discussions with Georgena Terry about the need for smaller wheels for many riders. We might do a longer or a shorter crank, especially if we can get some pre-orders to make sure we won’t sell only 10 sets, and then have 490 sets on our shelves for decades. As another 6’5′ cyclist with 95cm inseam I would happily invest in a dozen Rene Herse cranks of around 185mm. While I agree with your argument that for most cyclists cranks between 170 and 175mm are more than adequate, for those of us like Lisa, Fred and others who are clearly a few deviations from the standard cyclist in size, the solution does lie around 155 or 185mm or more. As a group we are generally poorly served by the cycling industry and I am convinced that a quality product aimed at the ignored extremes would sell very well. Lets hope the economics make sense one day. I’m looking forward to reading your forthcoming article about us outsiders!! I don’t quite have Stephen’s level of commitment (a dozen), but I’d go for a couple of sets of 185s. Some years ago the German magazine “Tour” tested a long version, and the tester was surprised how well he could spin a crankset, that was much longer, than he thought he could use. Maybe the Q-factor is much more important. It would be interesting to see some testing on that. I agree with everyone who has argued that size does matter. Maybe not the small differences, but certainly the bigger ones. My wife has benefitted enormously from 160 mm cranks. My Dutch framebuilder m-gineering has a line of cranks from 150-220 mm. http://www.m-gineering.nl/shop.htm These are heavy and very strong cranks, so most appropriate for the giants that are so common in the Netherlands. Personally, 171 mm is perfect for me, and I know what I will specify for my next bike….. I think most of us agree: Small difference, like those offered by most crank makers, don’t matter. Four millimeters – the difference between 175 and 171 mm – is too small to be truly significant, and other factors appear to be more important. Large differences probably do make a difference. A 150 mm crank will feel different from a 170 mm crank, and so will a 200 mm crank. I hope some day, we will be able to offer cranks in those lengths for those who want them. I respectfully beg to differ! 175 is significantly different than 170. I can tell the difference most every time, on a specific bike, if I switch back and forth between those two sizes, but change nothing else, and ride twenty miles or more. No one will ever convince me otherwise; I have too many decades of personal experience to support my position. I’m a low-Q-lover (about 137 for a double), but I’m also a 175 guy (on my road bikes of all flavors). You could only afford dies for one size at this point – we understand that. Please don’t try to justify it by saying that length doesn’t matter. You risk starting to sound like GP! (“I don’t sell carbon-fiber forks, so they are therefore dangerous”). That is a bad road to start down, credibility-wise, imho. Please don’t. 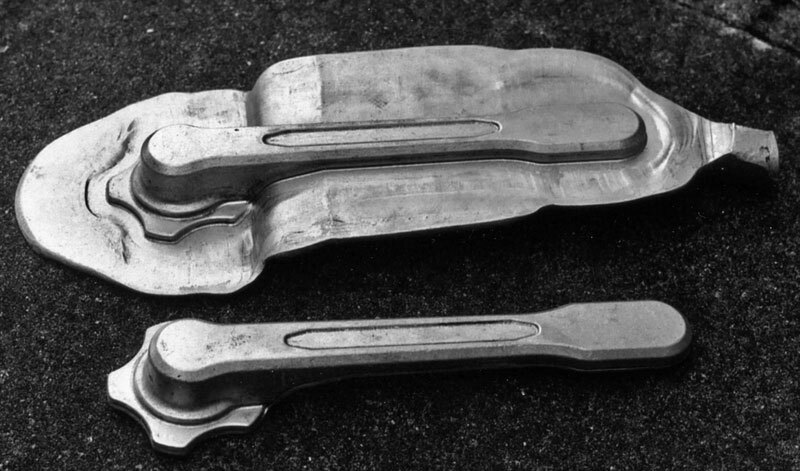 However, I also recalled that TA used to have two forging dies for the Pro 5 vis: One for the most common length – 170 mm, and the “adjustable length” forging shown in the post, which was used for all the other lenghts. (Before CNC, machining the cranks to length actually did increase the cost, so it made sense to have a “net shape” die for the most popular length.) Alain Breuil, the head of TA, told me that they saw a significant number of broken cranks from the other lengths, especially the longer ones (presumably used by the stronger riders), but almost none of the 170 mm cranks. It’s hard to believe that the 2% longer lever of a 172.5 mm crank causes more breakage, so I assume it’s the interrupted grain structure that is responsible for the reduction in reliability. When TA made new forging dies for the current-production model, they only made the “adjustable length” die to save cost. Knowing this, I prefer riding my old TA cranks, despite their high mileage and unknown history, over the latest-production ones with the interrupted grain structure. We don’t intend the new René Herse cranks only for show. In fact, all of us will be riding them! So I want them to be as strong as possible, without adding material that would make them heavy and bulky. (We did add a little material in a few spots – look at the transition from the pedal eye to the arm on ours and on an original Herse cranks – but that added a few grams only and doesn’t detract from the elegant design.) We thought long and hard about crank lengths, and the result is this post. I don’t doubt you feel the difference, but to know for sure, I would like to see a blind test. It has been well-documented that test subjects who believe there is a difference, will feel a difference. So much in fact that if you present the subjects with two identical samples, they often feel a difference if they are told they are different. Speaking of meaningful differences, I don’t think 3-5 mm in tread (Q factor) makes a difference, either. I happily spin my 137 mm double, but I don’t “bog down” on a 146 mm modern Campagnolo. Once it gets to 160 mm, I do notice it… Similarly, I have no doubt that those who prefer 150 mm or 190 mm cranks will not be happy with our 171 mm cranks. But I still have a hard time believing that 4 mm makes a difference. If cutting off the crank arm at the end creates weak spots by interrupting the grain structure, wouldn’t that be overshadowed by the weak spots created by cutting the hole for the pedal eye itself? The pedal eye will be the weak point, whether or not you trim a bit off the end. The end of the crank arm distal to the pedal eye doesn’t support anything. I believe that when you forge the crank to the shape of the pedal eye, the grain aligns in a circular pattern, so drilling a hole in the middle appears to be less of a problem. I’m happy to be of a size and temperament that will allow me to run these cranks. When do you expect them to become available for purchase? The crankarms were forged last week, the chainrings are being made, and the crank bolts should be ready soon, too. We hope to offer them in early December. I am 6’2″, using 175mm cranks, and have considered cranks over 190mm. 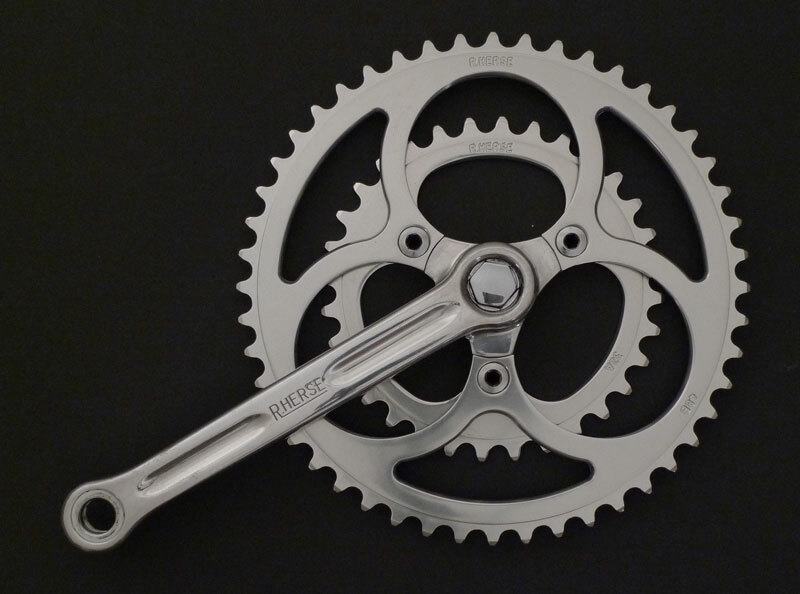 Recently, while converting a bike to Campy 10-speed, I found a great deal on a Record crank–but it was only 170mm. I was very concerned about the shorter length. Once I rode it, however, I found that I was actually feeling more comfortable with the new cranks. I noticed also that the new crank has a significantly narrower Q-factor than the the old one, which was an 8-speed Veloce model. I’m willing to consider that crank width is maybe more important than length as a result. I wouldn’t dispute that claim. However, I’d wager that you would be even happier on a narrow-Q crankset of 175 mm length!! The best of both worlds (i.e. variables). This still assumes that a) 175 is the best length for the rider, and b) that such a small difference is even noticeable. And if 4 mm makes a difference worth arguing over, then where do we draw the line? Why not offer cranks in 1 mm increments? Or 0.1 mm increments? Anyone have anything to say about how pedaling styles affect ones crank length/Q-factor preferences? A suggestion for another blind test for crank length. There are more and more ‘fit studios’ out there, and most of those studios have a fit bike, which includes infinitely adjustable crank arm length. I do not know what range of lengths are possible. If the range is broad enough to be meaningful (like I’d hope 150mm-200mm), then I’d suggest you have riders ride the fit bike, set up exactly like their own reference bike but with a random crank arm length. You don’t tell the rider what length they are using, and the rider can give only verbal clues like “I want them longer”, or “I want them shorter”, or “that’s just right”. Use that iterative approach to focus in on what length they prefer. Repeat with many riders and see if they end up at a length near the crank arm length they claimed to prefer at the beginning. That would be really interesting. Have the starting length randomly selected for each rider and have the step size for each adjustment random as well. That is an interesting test. Lennard Zinn did something similar years ago, and as far as I remember, the results were inconclusive. Zinn also measured power output, and the results were all over the map, with no clear correlation between crank length and rider height. I don’t think his study is online, but here is a critique with some quotes. Thank you for that link, it contains a lot of interesting information about studies in this area. My test suggestion above mainly intends to reveal some of the psychological insistence of running a particular crank arm length. When it comes down to ‘preference’ there is no arguing with someone whose mind is made up. A rider says he prefers 185s and you say “but you could run 171s and get used to it”. You could be right, but he still prefers what he says he prefers. I’m a 172.5 zealot. I run 172.5s on every bike I own. If you took one of my bikes and swapped in a 175 or a 170, I am reasonably confident I could find the bike and identify the change you made. I wouldn’t bet the mortgage, but I’d bet a pint. If, however you put me on a bike that basically fits me with an unknown crank arm length and allowed me to say “longer please” or “shorter please”, I wonder if I would end up at or near 172.5mm. I don’t know the answer. I like to think I’d be close. That is a test we could do: Whether you’d be able to tell the crank length in a blind test. If you can, we have proven that some people are that sensitive. (Like we did with the test of frame stiffness.) But if you cannot, then it doesn’t mean much – maybe you are the only one who cannot… So we’d need a lot of riders who believe they can tell crank length, which starts getting complicated. I would like to point out that as a shorter rider, crank length is very important to me. I have been an avid cyclist for years, but I have grown disenchanted with bicycling. At 5’3″, it is very hard to find bicycles that fit well, and crank length is a huge part of that. Longer cranks make my feet turn larger circles. This means that my knees have to come up higher, which is awful. 165 is as long as I go. Bummer. I was concerned about chanring availability anyway. I was concerned about chainring availability anyway. Trying to find a 2011 Shimano Dura-Ace ring, or one of the special Campagnolo “Compact” rings (with two bolt circles in the same ring!) in ten years probably will be harder than finding a René Herse chainring. Length is not much of an issue to me. I used to ride my road bike with 175 mm cranks to the track and then ride my track bike with 165 mm cranks and wasn’t conscious of the difference. I use 175 mm cranks on all my current bikes, but with a 90 cm inside leg measurement, 4 mm is minuscule. I’ve got different pairs of cycling shoes with probably that much difference is sole thickness, but I don’t notice it when riding except maybe for a few seconds. Pedal eye failures occur in forged cranks that are cold forged to their final lengths like yours will be, not just in cranks that are forged to one length and shortened as needed. Machining off the end of the crank is not the likely cause of pedal eye failures. The likely cause is the design of the pedal axle/crank interface at the pedal eye. The flat mating surface allows the pedal to rock slightly in the threads under the cyclical forces of pedaling, fretting the crank surface and causing fatigue of the pedal eye threads. The thread closest to the pedal is probably the most heavily loaded. Once a crack starts in the thread it propagates through the metal over many load cycles. Using a pedal washer as TA and some other makers have done potentially increases rather than helps the problem; it provides a sacrificial surface against the shoulder of the pedal axle rather than the face of the crank itself, which seems good, but would probably magnify the effect of the pedal rocking in the pedal eye threads by creating greater slip. A better design of this interface would be one that is conical, like the lug nuts on a car wheel. This should also eliminate the need for left hand threads on the left pedal. Lug nuts used to be flat and were left hand threaded for the wheels on the left side of the car up until 1960 or so; switching to the conical tapered design eliminated the sorts of problems that bicyclists still put up with (e.g., fretting-induced precession). Good luck getting the bike industry to make this simple change, however. There are lots of photos on the Web of this kind of failure which provide a lot of information as to how the failure happens and why. There is also one solution demonstrated of which I am aware- a chamfer machined into the pedal eye with a matching collet that slips over the pedal axle to approximate a conical lug nut-style interface. I know that Jobst Brandt thinks that the fretting of the pedal is the mechanism how most cranks fail. From what I have read, he certainly has broken a lot of Campagnolo cranks. Looking at images online of broken cranks, I see some failures in that manner, but interestingly, the cracks always go to the spot where the most material has been machined away. Coincidence? Maybe, but I don’t think it helps to interrupt the grain structure in that highly-stressed area. We’ll study this some more, and maybe we’ll offer the Jobst Brandt-designed taper collet and chamfer for the pedal/crank interface. I believe the pedal washer helps – the pedals are tight, and self-tighten with use, so I don’t see the rocking as the major problem. However, the pedal spindle has a sharp corner of hard steel that digs into the soft aluminum of the crankarm. Look at this Campagnolo crank (which probably had a dedicated forging die for each length, and thus no weak spot where these Nervar cranks failed that probably were machined to length.) It cracked at the bottom (when looking at it during the highest load in the pedal cycle), which is exactly where the pedal digs into the crank. If it was the rocking of the pedal threads, you’d expect the crack at the top. Providing a pedal washer distributes that point load at the pedal spindle/crank interface, and since the pedal washer is larger than the pedal spindle, it bends upward a bit at the edges and thus provides a gradual transition at the pedal spindle/crank interface. This reduces the loads that may have caused the pedal eye crack on that Campagnolo crank. In any case, the René Herse cranks will be equipped with pedal washers, but if you prefer not to use them, you don’t have to. Right now, all this is speculation, and it’s hard to model or test this. The main thing we can go with is that the original Herse cranks (as well as the similarly designed TA and Stronglight) have an excellent reliability record. Using a similar design in the places that matter gives us confidence in our new cranks, because we are building on these decades of experience. The images of broken cranks also show some design issues. The older Campagnolo cranks (and their copies from Sugino et al.) had a relatively wide and shallow cross-section, which does not resist torsion very well, and a number of them broke in the middle, where torsion is highest. TA, Stronglight and Herse used a cross-section that is much closer to square, which resists the bending loads of pedaling much better. Yes, most cranks break after a long time, but the places where they break still show us where the weak spots are. By the way, I have seen several 1970s Campagnolo cranks break at the stress riser where the spider meets the arm. A friend broke one in that after less than 10,000 miles, and he was a smooth pedaler and not the strongest rider, either.